Norled is the latest ferry operator looking to swap bunkers for batteries. Naval architects LMG Marin say it will design four battery powered vessels for the Norwegian operator to be built at Remontowa Shipyard. The vessels will be primarily operated on battery power but feature a Diesel Electric Hybrid system capable of running on Biodiesel in case of emergency. Two vessels with capacity of 296 passengers and 120 cars will run on the Festøya-Solavågen route, while two sister vessels with a modified design featuring smaller batteries and capacity for 395 persons will operate on the Mannheller-Fodnes route. An 11 minute charging process will take place via a shore power solution integrated with an automatic mooring system. Norled are just one of several ferry firms who this year have announced they are swapping bunkers for batteries in response to tightening emissions rules. 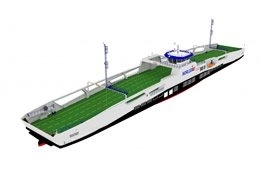 Canada's BC Ferries last month also signalled its intention to build four battery-powered ferries.